09/22/2013 UPDATE: Congrats to Huge Designs on their Da Vinci’s Demons Emmy win. 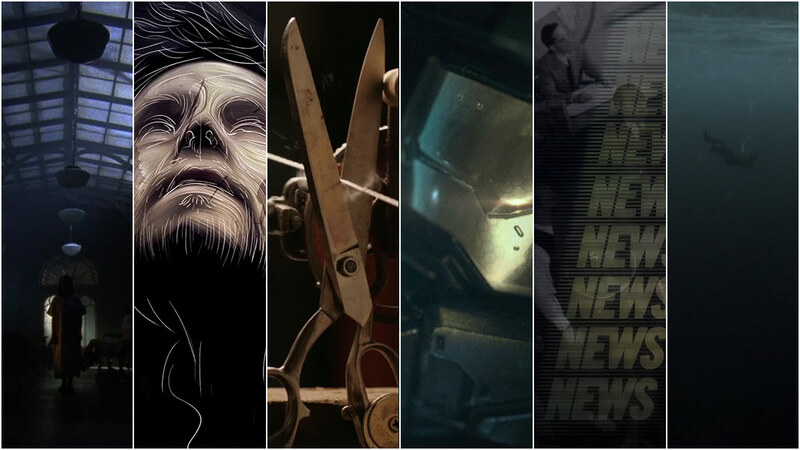 The 2013 Emmy nominations for Outstanding Main Title Design have just been announced and once again they feature a wide variety of work from studios both large and small. As is always the case with awards of this ilk, there are nominations which immediately resonate. Of course, there are also nominations which are sure to baffle audiences, the ones seemingly chosen simply because they exist. Below, we outline the nominations we stand behind, and those that baffled us outright. Taking a step back from season one’s skin-crawling house of horrors title sequence, Kyle Cooper and company instead concentrate on the patients and doctors of the Briarcliff Mental Institution, the setting for season two of this anthology series. While not as scary or innovative as the earlier version, the sequence’s focus on the new location certainly drives the point home. However, it doesn’t do much else, instead rehashing established horror tropes: one part gloom and decay, one part industrial score, a dash of disjointed limbs and contorted faces, a smidgen of gore, and a pinch of burning celluloid. It’s been nearly two decades since Se7en, though, so one would think Cooper would grow tired of producing dark, depraved, and roughly-textured title sequences. In the opening to Da Vinci’s Demons, Huge Designs illuminates new facets of Leonardo da Vinci’s feverishly inventive and enigmatic mind, and brings them to life in a way that only modern-day machinations could. The sequence reveals reams of hand-sketched notes, masterworks from da Vinci’s own hand, subtly suggesting that there’s more to the prolific artist and polymath than even he may have known. Bear McCreary’s driving and palindromic score is a delightful example of how to take inspiration from the source material and produce something innovative, appropriate, and truly mesmerizing. Ultimately, this sequence combines grace and intrigue, bringing together beautiful visuals and a spellbinding score to effect a triumph of motion design. Read our in-depth discussion with Creative Director Paul McDonnell of Huge Designs. 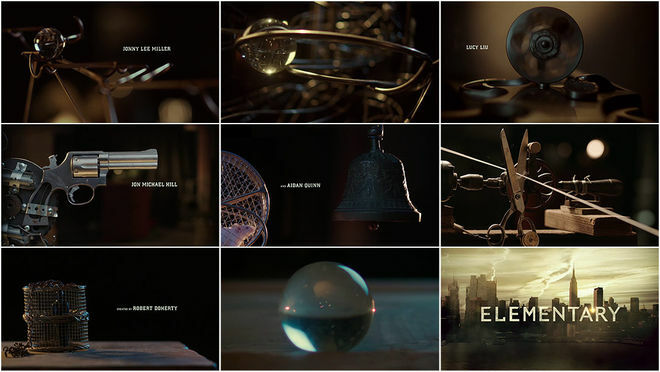 Reflecting CBS’s contemporary take on a classic character, Prologue’s opening title sequence for Sherlock Holmes series Elementary employs an impressive Rube Goldberg contraption to represent the manic detective’s unorthodox approach to solving crime. No doubt a nod to Stephen Frankfurt’s unparalleled To Kill a Mockingbird opening, the sequence follows a large marble on its journey through the elaborate apparatus. The sequence is held together by clever editing and whimsical production design, beguiling the viewer into assembling the machine for themselves. The effect is sheer sleight of hand, a fascinating distraction from the fact that in the end, the whole is not greater than the sum of its parts. Roped along, hoping to crack the case, the true mystery is why we bother at all. Read our in-depth discussion with Creative Director Simon Clowes of Prologue. Picking up where video game Halo 4 left off, Polynoid’s gorgeously rendered intro for the live-action web series Halo 4: Forward Unto Dawn chronicles four very lonely years of cryo-sleep in deep space. 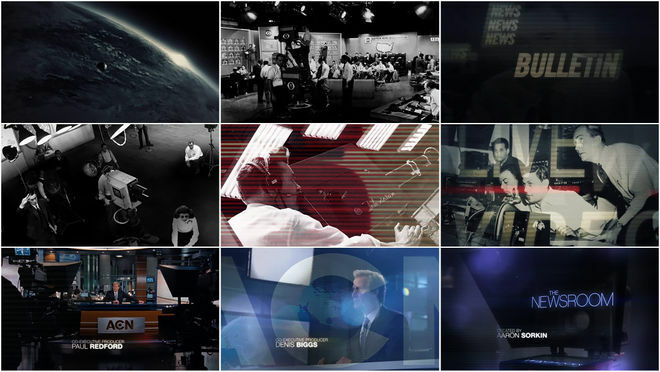 Split into five parts, the title sequence serves as a prologue for each “webisode” of the sci-fi miniseries and as a bridge between the events of Halo 3 and 4. Propelled by the disembodied chatter of a malfunctioning computer, the sequence manages to turn static elements like a derelict starship and a supersoldier popsicle into a compelling yarn. A testament to the team at Polynoid, the arresting visuals and refined effects outperform the low-budget series that follows in almost every way. If you ever wanted to know what time-lapse space snow looks like in zero-G, you have your answer right here. 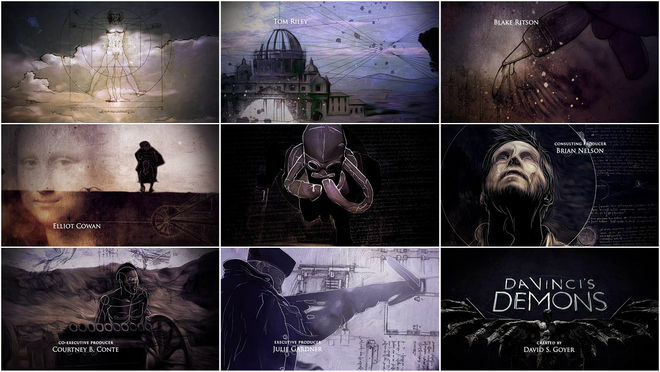 Win or lose, Forward Unto Dawn’s title sequence Emmy nod paves the way for future web-based and on-demand TV programs to seriously compete in this category. The success of the title sequence for History Channel’s new series Vikings lies in its ability to establish the appropriate atmosphere. Submerging the viewer in the aftermath of a mythic battle, it lays bare the thematic undercurrents of the show while leaving much of the barbarous detail to the imagination. Coupled with Fever Ray’s haunting dirge “If I Had a Heart,” The Mill’s sequence is enveloping, entrancing, and an excellent emotional primer for the visceral drama to follow – which, after all, is exactly the point. Read Watch the Titles in-depth discussion with Creative Director Rama Allen of The Mill.